The Manchester Road race is one of New England’s oldest and most popular road races. 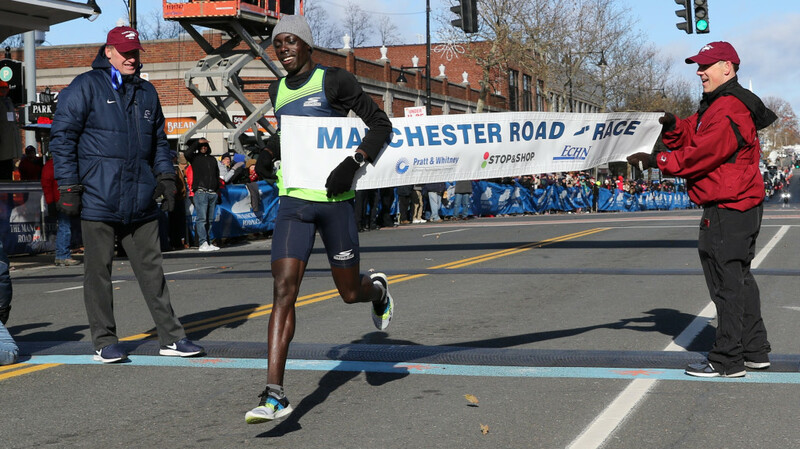 The 80th Manchester Road Race will be held on Thanksgiving Day. It starts and finishes on Main Street, in front of St. James Church. The Connecticut Sports Writers’ Alliance recently honored the Manchester Road Race. The CSWA, which is comprised of sports journalists and broadcasters from throughout the state, presented its prestigious President’s Award to the Manchester Road Race Committee at its annual Gold Key Dinner in Southington. The group gives the award each year to the individual, team or organization that has made a significant contribution to sports in Connecticut. Walked the course. This was my 33rd year in a row. Used to run times below 40 minutes, but now after suffering from spinal stenosis, and having a fusion (L 4, L5, S1) I walk to course. Still love the race, and can’t wait for the next Thanksgiving! 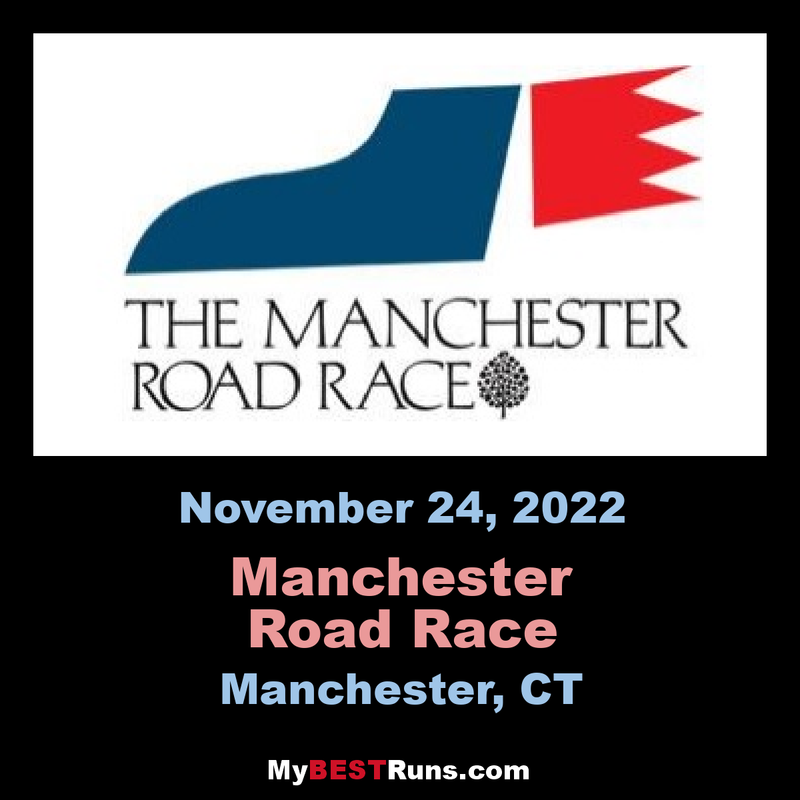 The Manchester Road Race was born in 1927. "Francis" 'Duke' Haraburda' had the enthusiasm, Manchester Assistant Recreation Director Frank Busch had a willing ear, and his boss, Recreation Director Lewis Lloyd, was in a position to do something about it." Francis Haraburda had been captain of the Manchester High cross-country team in 1927. The season ended in mid-November and, in his opinion, much too quickly. He thought it would be fun if Manchester held a Thanksgiving Day cross-country race after the scholastic schedule was completed. Haraburda mentioned his idea to Busch, who then proposed the race to Lloyd. Lloyd and Busch took the idea to Charles "Pete" Wigren, Manchester High School's first track coach, and he took it from there. The major problem they encountered was choosing a course for the race. Cross-country racing suggested running off road through a natural environment. In the late 1920's such a route did not exist in an up and coming town like Manchester, which was already covered with paved roads. The idea of a road race did not seem practical. Road running, other than 26.2 mile marathons, was not popular at that time. They settled on a course that had the start and finish at the High School, which at the time was at the bottom of Main Street. The route followed Main Street to Mt. Nebo to Charter Oak Street, down Highland Park to Porter Street and finally East Center Street back to Main Street. This combined trail running with some road running. The five and a half mile course was much more difficult than today and included territory now occupied by Interstate 384. Lloyd, Haraburda, Busch and Wigren mustered a few local runners. "There were 12 starters in a steady drizzle of rain which continued until the finish." A few Manchester residents also went out to stand on the edge of the course and support the runners. The winner of the first race was John McCluskey, who completed the course in 29:36 and was awarded a silver loving cup for his effort. 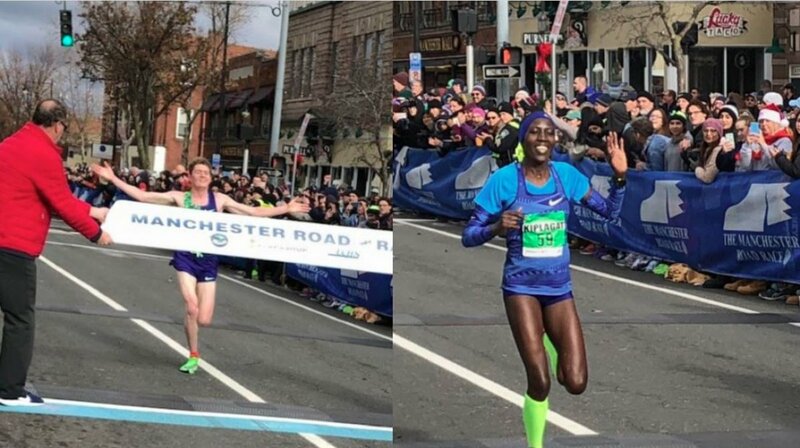 A local newspaper, the Manchester Herald, said the Manchester Road Race was "a big success." Ninth place finisher, Bob Dougan saw it differently. He commented, "The first year didn't really amount to much. The reaction of most people in town was 'So what? So a couple of guys are going to run five miles. Big deal.' We had no idea whether the race would survive to see its second year." Not only was the race held the next year, in 1928 it became an annual tradition. Jim Gwin won in 1928 and Walt Bennet in 1929. Thanks to the presence of Joe McCluskey, John's younger brother and a quickly rising champion high school runner, the Manchester Road Race took off in 1930, with crowds of 10,000 in downtown Manchester on race day. McCluskey won with ease in 1930, 31 and 32, but decided to pass up the race in 1933 and give someone else a chance. McCluskey's absence and the ongoing depression would soon bring an end to the Road Race. As the race had begun to claim a name for itself, local businesses started to take an interest. They promoted the race in their shops, and donated prizes for the winners. However, the depression hit and put this to an end. The race organizers could not ask for donations when these businesses were barely surviving themselves. In 1934, 38 racers crossed the finish line, led by John Turley. Turley, a Yale student, won the race with a time of 24:43. This marked the end of the first chapter in the race's history, as the continued misery of the Great Depression followed by the coming of the Second World War, led to cancellation of the event until its revival in 1945. Beginning in 1927, the Manchester Road Race started with just twelve runners. Today, there are more than 15,000 registered runners and walkers. In 1961, the first woman ran the Manchester Road Race.